The mystic inscription "Torque Induction," that appeared in 1971 on the lateral panels of the Series 2 off-road Yamahas, hid a technical revolution with roots in the dawn of motorcycling: automatic intake valves. The technique evolved fast. It was soon common place, giving extraordinary impetus to the growing refinement of Japanese two-strokes. Automatic intake valves had been used on four-stroke engines at the turn of the century, but the idea of using them on two-strokes was left up to DKW, who had fitted such valves sporadically since 1925. 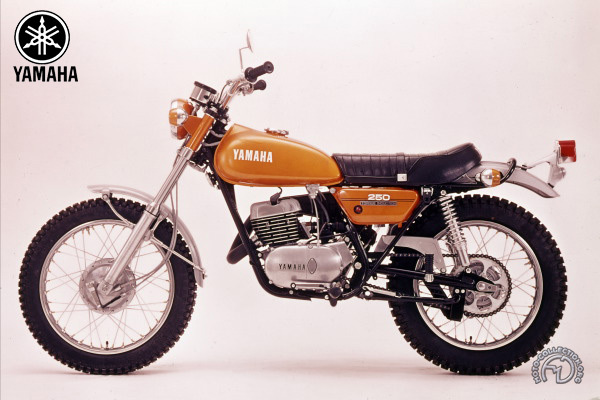 Yamaha was responsible for having modernized and developed the concept for the 1971 Series 2. As devised by Yamaha, the setup consists of thin metal Daps (now of carbon fiber) in the intake passage downstream of the carburetor which open and close automatically in time with the creation of crankcase suction by the rise and fall of the piston. The system is light and foolproof, and permits the use of variable-intake port timing without the risk that the incoming gas is blown back towards the carburetor. This gives a great improvement in engine flexibility. Compared with the first DTl of 1968, the Series 2 underwent a number of modifications. This version saw the DT2 arrive at full maturity as one of the best trail bikes of irs generation, equally at case in urban traffic as off-road, and just as ready to confront fast track work as to ride gently up a difficult ascent. Yamaha s concept of combining the virtues of scramblers and trials bikes created the "trail" category, a brilliantly successful compromise.